Do You Have a Valid West Virginia Premise Liability Claim? Did the dangerous condition cause you to fall? Did the property owner know about the unsafe condition or should he have known about it? Did the property owner post warnings? Was the unsafe condition open and obvious? Although it may seem obvious that to have a valid fall injury claim, the dangerous condition must have caused your fall. However, an insurance company will closely investigate whether there are other explanations for the cause of your fall. For example, insurance adjusters often scrutinize medical records to see if the fall victim has any health condition that could have caused them to fall. This is one of the many reasons to contact an experienced injury attorney if you sustained substantial injuries because of a dangerous condition on another’s property. For a Free Consultation, we invite you to call West Law Firm at 1-877-943-9378 (WEST). Did the Property Owner Know About the Dangerous Condition or Should He Have Known About It? Under West Virginia law, generally, a property owner has to have known about the dangerous condition before you fell. To meet this requirement, you may also be able to show he or she should have known about the unsafe condition. Property owners generally have a duty to conduct reasonable inspections of their property for unsafe conditions. If they don’t conduct reasonable inspections of their property, property owners usually can’t claim they didn’t know about the dangerous condition as a defense. If you’re able to establish the elements above, the insurance adjuster or property owner may argue that warnings were posted, and, thus, the property owner is not responsible for your injuries. 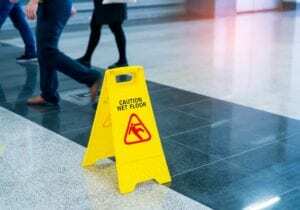 For example, although a business’s floor may be wet, if there’s a clear sign that says, Caution: Wet Floor, then it will be more difficult to argue the business’s negligence caused you to fall on the slippery floor. On the other hand, the property owner may have put the warning sign in a location where you couldn’t see it before you fell. In that case, you’d have a good argument that the warning was inadequate. Was the Hazardous Condition Open and Obvious? In 2017, West Virginia lawmakers passed a law that limits people’s ability to pursue personal injury claims if they fell because of a hazardous condition that was open and obvious. This is one of the most disputed elements of a slip or trip and fall claim in West Virginia. Winning this argument usually requires the help of an experienced injury attorney. What to do if Injured in a Fall on Another’s Property? If you fall and are injured, it’s important to seek medical help immediately. If you’re injured and delay in seeking treatment, an insurance company may later claim you weren’t really injured or you would have sought medical treatment sooner. Before giving any statements to anyone but the police, it’s extremely important to call an experienced West Virginia slip and fall lawyer. Premise liability claims also often involve State and City codes and specific safety standards and regulations that a good premises liability attorney should be familiar with. To recover fair compensation for your injuries, it is necessary to identify the dangerous condition that caused you to fall. Because walkway’s dry, sidewalks may be repaired, and objects may be removed, it’s important to preserve the evidence at the site of your fall as soon as possible. If you have a camera (or cell phone camera) with you, take photos of the slip or trip hazard if doing so won’t aggravate your injury. Better yet, ask someone at the scene to take pictures of the hazard and your injuries. If you fall at a business or public place such as a store, supermarket, restaurant or mall, you should immediately report your accident to management. If you slip and fall and are injured on public property, call 911. It is very important to document your accident and injuries in this way. Incident or accident reports document important information, including the date and time of your fall, the names of witnesses, and the circumstances of your injuries. Most importantly, incident and accident reports provide tangible evidence that your slip and fall accident actually occurred in case there are no witnesses or witnesses later become unavailable. What Compensation is Available for Slip and Fall Injury Claims? Although punitive damages are not commonly available in slips and fall claims, an experienced attorney may be able to help you recover punitive damages if the defendant’s conduct amounted to a reckless, wanton or willful disregard for safety. As you can see from the above, slips and falls are often challenging and difficult to prove. Below are some actions an experienced injury attorney can take that will likely help your case. If you or a loved one has been injured by negligence, we invite you to call West Law Firm for a Free Case Evaluation toll free at 1-877-943-9378 (WEST). And there’s NO FEE unless you receive financial compensation. If you can’t come to us, one of our West Virginia Injury Attorneys will come to you.